At Mayor Law, a Portland spinal cord injury lawyer is acutely aware of the challenges and frustrations that often come with these types of injuries, and can help you hold the negligent party responsible for the harm they have caused. From recovery plans, cost of treatment, future costs of care, and impact to a family’s financial future, you need a specialized attorney who will leave no stone unturned and maximize the compensation you deserve. Every part of the human body works together by way of the spinal cord. The spinal cord is part of the nervous system; the largest nerve in the body. If the spinal cord is damaged, the brain and body cannot adequately communicate about movement, sensations or involuntary activities of the body. This is why spinal cord injuries have such devastating and complex effects on the people who suffer from them. Contact Portland spinal cord injury lawyer Travis Mayor to have your tough questions answered: (503) 610-0005. Consultations are always free. You pay nothing unless we win your case. A spinal cord injury is damage to the spine and bundles of nerve fibers that make up the spinal cord. These nerve bundles play a key role in transmitting signals to and from the brain to the various extremities such as arms and legs. They are vital to controlling how the body moves and what it feels. Injuries higher on the spine, meaning closer to the brain, have a greater impact on the body and can result in paralysis of the body from the neck down. Injuries lower on the spine (farthest from the brain) may affect fewer external body parts, such as only the legs. Spinal cord injuries are classified as a “complete SCI” or “incomplete SCI”, meaning a total or partial loss of motor and sensory functions below the level of injury. Almost 50% of injuries are classified as complete SCI and result in total loss of motor control and feeling. In these injuries, the spinal cord is rarely cut, but the loss of motor control or paralysis is caused by a contusion (bruising) to the spinal cord or pressure from a physical injury to the spine. The spine is very complex and most susceptible to injury as a result of severe impact (such as a head-on car crash or fall) or abrupt movements (such as a side-impact car crash), or a combination of the two. 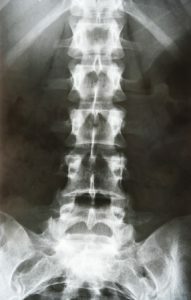 A spinal cord injury can be caused by the impact of an accident or the subsequent movement of passengers within the vehicle. These injuries can lead to costly and very complex recovery plans. Spinal cord injuries are usually caused by a traumatic accident, and it is common for the injured person to suffer other trauma including chest, abdomen, and vital-organ injury. While progress in medical care and rehabilitation are continuing, there still is no “cure” for SCI. The main complications arising from these injuries include pneumonia, pressure ulcers, deep vein thrombosis, and can be found in two-thirds of the patients with complete paralysis. Anyone suffering from SCI must anticipate potential secondary complications that may not be obvious within the first few months after an accident. Case Example: Client in his 20’s was severely injured on the job when a piece of heavy equipment fell on him due to an operator error and a machine defect. His traumatic injuries resulted in complete paralysis from the waist down and permanent disability. A claim was brought against the manufacturer and owner of the defective machinery. After a lengthy battle, the case settled for a confidential amount, and included the client’s past and future medical expenses, additional medical needs such as a lifetime of wheelchairs, and lost income both past and future. This case required extensive legal efforts to prove the defendants were negligent, and that their conduct directly caused injury to the client. To minimize the amount of potential damages, the insurance company’s legal team attempted to establish that the client’s actions at the time of the accident contributed to some level of negligence. If this was true then any damages awarded would be reduced by the percentage amount that the client contributed to the cause of the accident. The insurance company’s legal team also attempted to minimize the damage amount by arguing that future medical expenses and lost income would not be as great as projected. In the end, the insurance company could see the strength of the client’s case and raised the offer to settle several times the initial amounts presented. Seeking compensation for back or spinal cord injuries is often a complicated and lengthy process requiring an experienced Portland spinal cord injury lawyer to establish the facts and prosecute the case. The cost of living with a spinal cord injury is something most people cannot define and completely underestimate. It takes more than simply filing a lawsuit and waiting for settlement offers to come in. The at-fault party’s insurance company will obtain aggressive legal representation and work hard to minimize the value of your injuries. They will claim you were fully or partially at fault or that your injuries are not as severe as you claim. It is important to seek legal representation from an experienced attorney who specializes in litigating catastrophic injury cases involving spinal cord injuries. Your Portland spinal cord injury lawyer must work hard on your case, have adequate financial resources, and be prepared to go to trial and win. The compensation you may be legally entitled to receive in a spinal injury case is called “damages.” There are two categories of damages: economic and non-economic. Economic damages are costs that can be quantified such as medical expenses, lost wages and income, and property damage. These estimated costs do not even include compensation pain and suffering or lost earnings which substantially affect any potential injury settlement or jury verdict. Do I need a Portland spinal cord injury lawyer to represent me or can I deal directly with the insurance company in an SCI case? Delay the process with the goal being to pressure or wear down the injured claimant and increase the cost of pursuing the settlement. Read more about insurance company delay tactics. Switch responsibility for the accident away from the defendant toward the injured claimant or some other person in an attempt to “share” responsibility for the accident and hence reduce any award or settlement by the percentage of fault – comparative fault. Minimize the damage amount by arguing the claimant’s injuries were not as severe or debilitating as claimed, or that future medical expenses and lost earnings are not as great as projected. This type of case is not one that can be successfully resolved by dealing directly with the insurance adjustor. Our recommendation is to always speak with an experienced Spinal Cord Injury Lawyer in Portland to evaluate your specific case factors, your situation, and the appropriateness of retaining a lawyer. Remember, when you deal directly with an insurance company, you are dealing with a large, corporate entity, specifically staffed with lawyers and specialists trained in techniques to minimize the value of your claim. They utilize many techniques that are very effective in reducing the value of their offers to you. You can read about numerous examples of case results were settlement offers increased by a factor of ten or more when clients have an aggressive spinal cord injury lawyer representing them. Do not give up your only leverage in dealing with an insurance company; your right to legal representation and due process. We provide an initial free consultation and personal injury case evaluation for all potential clients and will give you an honest assessment of the case including a potential value and strategy to win your case. As a Portland Personal Injury Attorney, my goal is to help severely injured victims restore their lives. My firm can help you by reducing the hassles and inconvenience of your case while maximizing your financial compensation. Travis Mayor has recovered millions of dollars for his catastrophic injury clients. Initial case evaluations are always free. Feel free to email or call (503) 444-2825 to discuss the cause of your injuries. If you are unsure whether your situation or case falls within our areas of practice, please contact us anyway. If your legal needs are in an area of law we do not ordinarily handle, we would be happy to recommend reputable attorneys who do so.